Bellular Hexatosis is a unity gamejam (AdventureJam at Game Jolt Jams) game created by Neotenomie and Porpentine on 18 Apr 2015. It was later released as a full game on itch.io on 06 Nov 2015. The sigil was added on the itch.io release. Right on the start of the game, before the title, the sigil is visible as a model behind the player. It is submerged upside down underwater. Clicking it makes it rotate and become fully visible. Four "fingers" of the sigil light up with colours as they are clicked. After clicking them all, the sigil spins 180 degrees and the cheerfull sound is played with confetti falling down. Further in the game the player encounters four coloured mushrooms. Clicking them in the order the colours were lit on the sigil makes the piece apper. 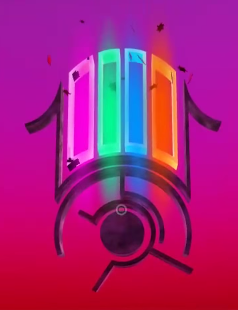 The colours on the sigil are always assigned in order Orange — Blue — Green — Pink to the "fingers" as you click them, so the order they will be after the sigil spins around depends from the player (note the sigil spinning 180 degrees). Click on the sigil underwater, then click the "fingers"
Remember the order of the colours. Turn around and click the title. Proceed to the first platform and click the mushrooms in the order of colours. The puzzle piece will appear above the mushrooms. The enumeration of colours is called Passports. "Fingers" of the sigil relate to PassportDataThings. The piece is stored as a vector data in MonoBehavior class TweenTimer. It's bound to the scene as a Unity GameObject with the name "Result" in the "level8" assets file. This page was last edited on 30 September 2016, at 22:10.